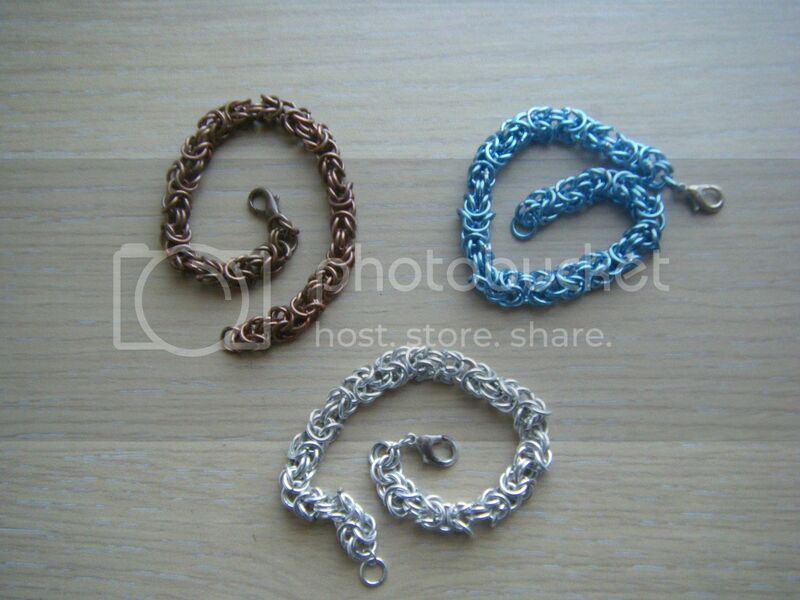 I'm going all repetitive again ladies, no not more tea-light holders, more chain maille bracelets! And when I say "more", I mean "one". Oh dear, this post isn't going well so far is it? I'll start again. 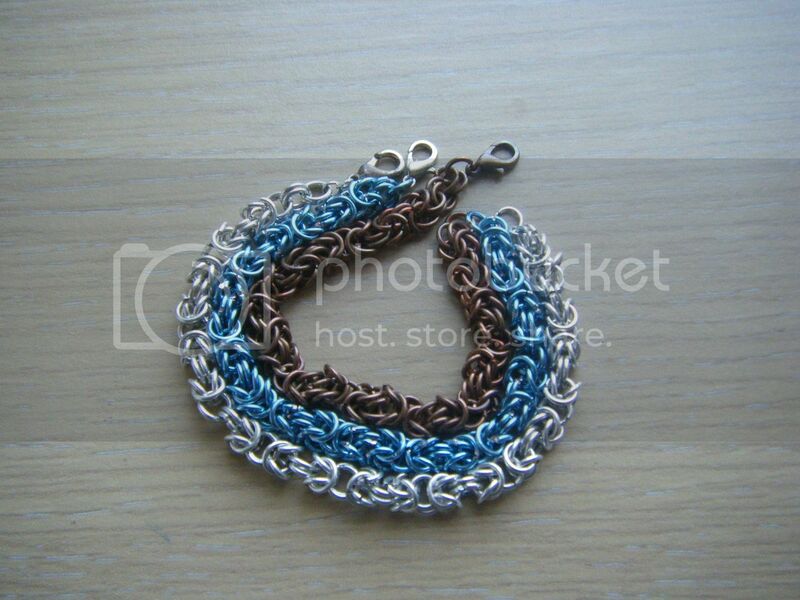 I made a chain maille bracelet! It's the byzantine weave again, like I made here and here. 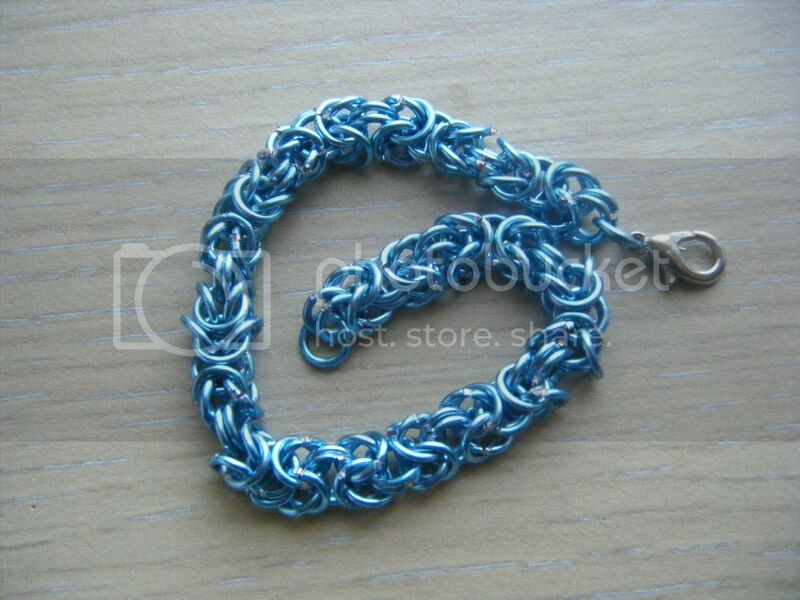 I see I titled both those posts "Chain maille" too. So at least I'm consistent with my repetitive behaviour! This time I used blue wire. That was startlingly obvious, wasn't it? Bit of an arty shot of the three together. I've been wearing the copper and silver ones together and wanted some coloured ones to go with them. I made the blue first as I have a lot of blue clothes. I haven't worn a single blue item since I made it... I have more wire to make more colours of bracelets, but I have other things that need doing first! Anyway, this blue bracelet fought me all the way. The silver and copper ones were nice and easy and quick. This blue one was a pain in the arse. The jump rings kept falling on the floor and they wouldn't open or they were opened the wrong way or the pliers slipped... It was just frustrating from start to end. Interestingly though*, I made 2 more jump rings than I'd need. I mean that I made a load of jump rings on my Gizmo, no counting or anything and when I'd finished the bracelet I have 2 left over. *OK, OK, so it wasn't even slightly interesting. But I tried. Very cool! My mom has some pieces that my grandmother (or her grandmother) made--I'd love to give it a try sometime. Love that blue! Those are beautiful! You have a lot of patience to make them. I get stressed out using just one jump ring! Love it. I love the color. I'm always accused of buying everything blue. OOh, does that mean you'll be making another one to use up the two spare rings? That's a nice blue. I must have missed the first 2 chain maille posts and now you've posted with the same name again it just makes them easier to find :).